When I saw Zoe posted the Vienesse Biscuits, I immediately baked a small batch for our afternoon tea. When this delicious snack is dipped in the melted chocolate it is light and buttery and the delicate crumb will just melt-in-your mouth. Mmm…. definitely just can’t stop at one! Place butter and sugar in a mixing bowl. Beat at low speed until light and fluffy. Beat in the vanilla extract, sift in flour and continue mixing on minimun speed until a well mixed. (do not overmix). Put the mixture in to a piping bag fitted with a 1cm (1/2 inch) star nozzle Wilton 1M. Pipe the mixture into pan lined with baking sheet, spaced apart to leave room for spreading. You may pipe any shape that you desire. Bake for 10-13 minutes, or until pale golden. Transfer to wire rack to cool. Put the chocolate in a small bowl over a pan of simmering water or microwave to melt. 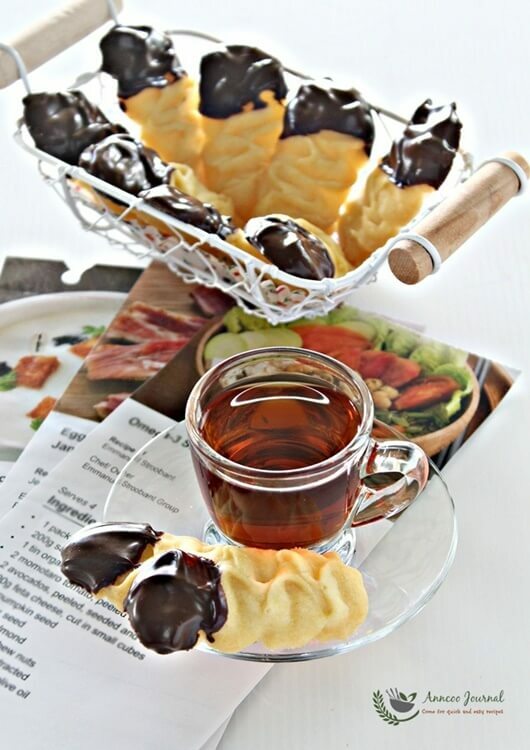 Dip one side of the biscuits into the melted chocolate and place them onto the baking papers. Allow chocolate to set before removing them from the baking paper. Hi Ann, can this cookies be kept in air tight container for days? Will the coating melt off? Hi Yeow Shaann, I stored the cookies in the airtight container lined with parchment paper after each layer. The chocolate will not melt You can use semi-sweet chocolate (not converture choc). Lovely Viennese biscuits! Yes, I could not stop at just one or two! Buttery and delicious! Thanks for baking along with us! hi ann, quite true what you said about room temp. Our room temp here is much more warmer..i usually leave the butter to a little soft when the recipe said leave to room temperature. anyway, the viennese cookies that i made i did left the butter to much more softer than usual cos the recipe that i used stated 'very soft butter' 😀 and so i was tempted to leave the butter out a little longer this time. Thx for taking your time to bake these cookies with us. I love the light buttery and delicate crumbs too. 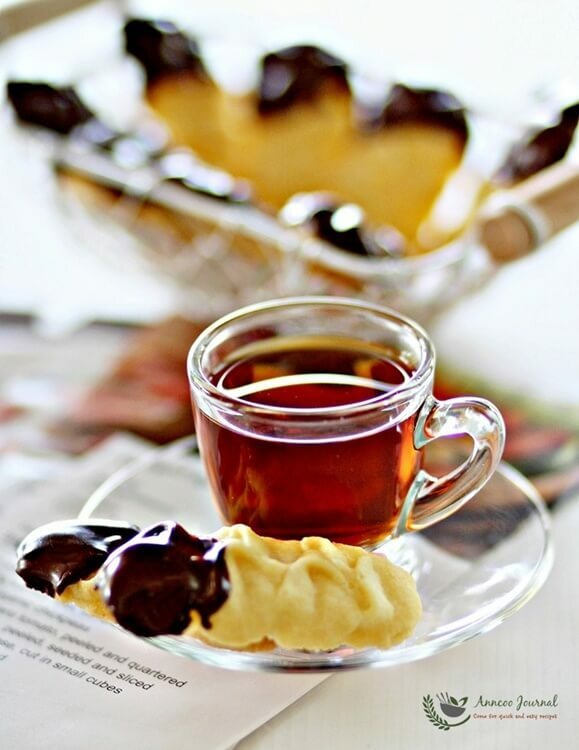 I see that you have enjoyed a wonderful tea time with these lovely and delicious Viennese Biscuits ^-^! Ann, your Viennese biscuits do look very tempting indeed! They look melt in mouth and beautifully piped, Ann. Who can resist these yummy looking cookies …… mesmerised by your first picture! Yum! You are really "chop chop" with your baking… Within the day, you can bake these awesome Viennese shortbread. hahaa…. yes, I was a little amused when I tried this recipe. Hope this will not confused our readers 😀 What I totally agree with you is the butter must not over-beat and the flour too, not to over-mix. Another reason is the climate different between your side and ours. The hot weather will melts the butter quickly, that was the reason why the butter must not be too soft. Viennese cookies are so simple and delicious! Love the pretty ruffles you pipe. Simple ingredients and yet so delicious, yummy!